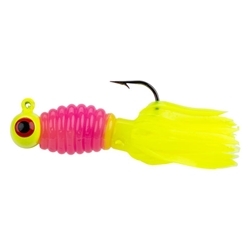 Strike King Mr. Crappie Sausage Heads are great for vertical jigging or casting. The sausage shaped head prevents it from side to side for the perfect hook set. This bait comes in a 1/16oz or 1/8oz sizes with Eagle Claw Laser Sharp Platinum Black hook and comes rigged with a Crappie Thunder plastic.